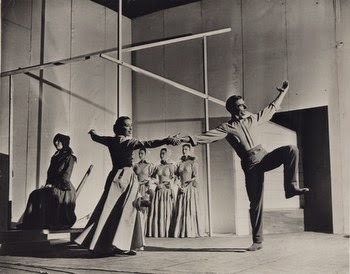 Seventy years ago today, Aaron Copland and Martha Graham’s ballet, Appalachian Spring, had its premiere at the Coolidge Auditorium of the Library of Congress, Washington, D.C. As I am currently writing a book about this fascinating work, I had planned on preparing a contribution to Musicology Now celebrating the anniversary by taking us back to the United States at the end of World War II and by exploring the ramifications of the premiere’s historical in-between moment for the reception and reading of the work. But instead, my thoughts are circling back to my beautiful visit to Carleton College earlier this month, where I spoke about Appalachian Spring, and to the discussions following a presentation I gave there on this topic. I had framed my talk at the College within the larger question of music’s associations with politics—broadly conceived—moving from such Coplandiana as the music for Governor Rick Perry’s infamous 2011 campaign advertisement to more recent events that related music and politics, in particular Beyoncé’s performance at the MTV Video Music Awards on August 24, 2014 (cuepoint 10'20"). Here, Beyoncé added eye-catching visuals to her performance of “Flawless,” a song that samples lines from the TED talk “We Should All Be Feminists” by the Nigerian author Chimamanda Ngozi Adichie and is itself remix of sorts of “Bow Down” from early 2013. 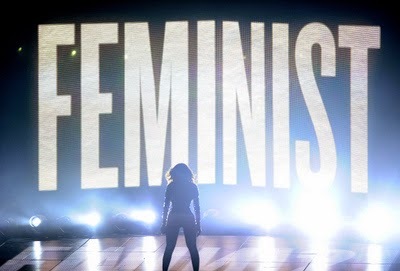 “Flawless” had already garnered discussion about Beyoncé’s feminism when it was released in December last year, but neither the track nor the official music video rendered Adichie’s words as visible as the MTV/VMA performance, which projected them in huge letters above and behind the musicians. This performance was a political act. Despite the celebratory articles in the national press, however, an underlying current of comments worried whether it was an empty gesture by a celebrity, and one out of place in an MTV performance. How appropriate was such a political claim in a musical context, and in a commercial pop-music event at that? The question of Beyoncé’s musical and performative feminism bubbled up again a month later, after Emma Watson’s beautiful United Nations speech on September 20. Within hours after Watson’s speech, her demure poise and expressive clarity were held up as an example on how to do feminism right in such tweets as “Well done, Emma Watson. THAT is feminism (watch and learn, Beyoncé),” or “That’s feminism. . . . Not a neon sign and spandex.” It seems to me that not only is this kind of patronizing comparison utterly racist by invoking cultural tropes of racialized intellectual ownership, but it also speaks to the tightly circumscribed roles we accord to musicians in our world right now. It implies that a musical performance cannot—and should not—lay claim to serious political issues in the case of a female pop star who performs race and sexuality in multiple complex ways. Had my Carleton story stopped here, this blog would still be about Copland alone (though I will return to Appalachian Spring in a bit). But the day after my presentation and discussion with students, I went to Convocation at Carleton College’s Skinner Memorial Chapel, where the poet and feminist activist Daisy Hernandez spoke about “Feminism, Sofia Vergara, and Writing about Familia: A Talk on Media Representations.” It was a moving and engaging presentation. In the Q&A, however, one of the students who had been at my lecture asked about Beyoncé and how Hernandez would see her contribution to feminism, given the controversy over her and Watson. Nimbly sidestepping any discussion of feminism in relation to musical composition and performance, Hernandez instead celebrated as feminist achievement Beyoncé’s commercial success as a businesswoman—just as, in her presentation, Sofia Vergara’s business acumen had been framed as the reason why the actress deserved our serious attention. Given capitalism’s inherent patriarchal structure, such slippage is troubling from a feminist perspective. Feminist critique, I had hoped, would question the masculinist hegemony of capitalism rather than embrace it by handing the primacy of social empowerment over to capital while relegating cultural expression into the realm of the ineffable—a surprising strategy for a politically engaged poet who, in her presentation, had spoken so eloquently about the power of words as cultural agents. Whether intended by Hernandez or not, her answer depoliticized (and feminized) music and its performance and, instead, located political meaning and value in a neoliberal construction of masculinist economics. Hernandez’s neoliberal framing of Beyoncé seems like a strange echo of the France Musique website dedicated to Aaron Copland, where its comments show traces of Adorno-inspired marxism. I am reading this website as a culmination of decades of Copland reception during which the composer was increasingly represented as apolitical—most famously in the United States Information Agency (USIA) documentary, Copland Portrait, in 1976—until his musical idiom could stand for “America” however conceived, whether in terms of party politics or as a stand-in for the nation abroad. The biographical note on Copland on the France Musique site casts Copland as an audience-pleaser, a familiar way to feminize an artist in the world of Western music. But it gets worse: the text implies that he did so for financial gain as well, putting him perilously close to the nadir of artistic prostitution. His ballets—the paragraph ends—left him a “multimillionaire by the time of his death.” This is a scarcely veiled indictment of America as a place where business trumps everything else, an old chestnut of French anti-Americanism. However the economic success of a musician might be constructed in a particular discourse network—positively by Hernandez for her American audience, and negatively by France Musique for its French readers—there seems to be a curious transnational agreement that music pleasing its audiences, or worse, targeting a particular market, is suspect when it lays claim also to a radical political message. There is no need for Jed Perls’s New Republic piece that crows “Liberals Are Killing Art,” and for whom true art is “unfettered metaphor and mystery and magic” transcending politics through its beauty. This kind of depoliticization of music is deeply engrained in our culture—even where liberals are concerned—when art does not follow the rather narrow ideology of what is allowed to be political, and what not. On the seventieth birthday of Appalachian Spring—a profoundly political piece, whose entanglement within historical and political contexts has been shown by colleagues ranging from Howard Pollack and Elizabeth Crist to Nadine Hubbs, Emily Abrams Ansari, and Alex Ross—it is perhaps useful to reflect on why we, as a listening collective, still refuse to take music seriously as a self-conscious expression of politics when it does not conform to what we consider political art. Appalachian Spring ensounded, and ensounds, concerns about war, nation, and personal identities. Likewise, a glitteringly spandex-clad and sexually affirmative performer can be, and is, a powerful musical voice for feminism. I would like to think that Copland, a musician invested in musical politics in all its ramifications, would have applauded Beyoncé’s performance and forgive me for transforming a birthday post on Appalachian Spring into a call to celebrate the potentially empowering politics of audience-pleasing music not despite its mainstream appeal but because of it. Annegret Fauser is Cary C. Boshamer Distinguished Professor of Music and Adjunct Professor of Women's and Gender Studies at the University of North Carolina, Chapel Hill. She is a past editor of the Journal of the American Musicological Society, and the most recent of her several books is Sounds of War: Music in the United States during World War II (Oxford UP, 2013). Website and video HERE.